San Francisco is doing a great job to increase the space allocated to cyclists in the streets of the city by the bay. The Municipality is driven by the SF Bike Coalition which does amazing work to make sure cyclists find a place in this so unique urban place. 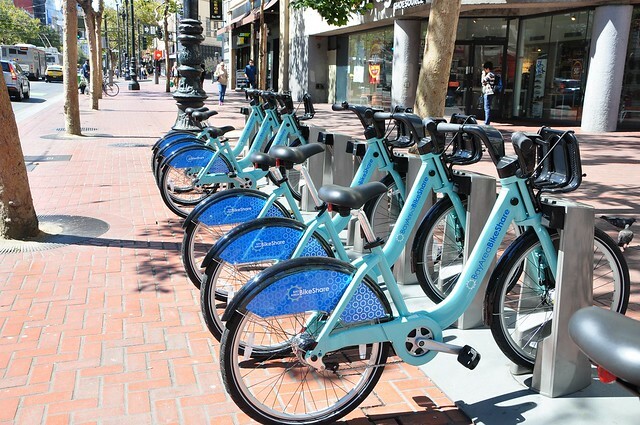 At the end of August, the Municipality of San Francisco launched a bike sharing system named Bay Area Bike Share (BABS). The bike station network does not cover all the city yet. 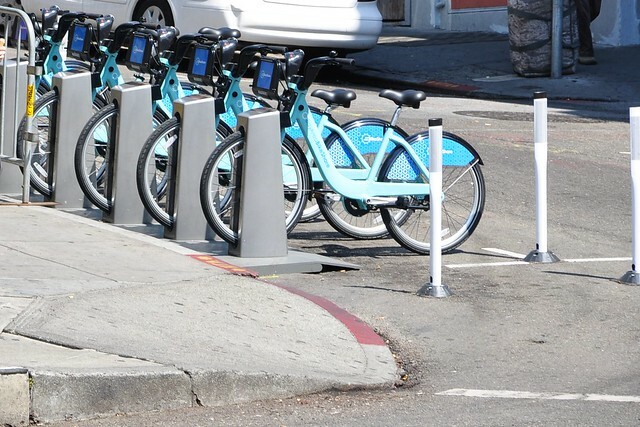 The stations are mostly installed along Market Street, in Downtown and SoMa. They are also set up in several cities of the Silicon Valley : Redwood City, Palo Alto, Mountain View and San Jose. The idea is to co-locate train and bike stations to offer to the Caltrain users a way to finish their journey by bike. BABS is still a small-scale pilot program; 700 bikes are available, half of which are located in San Francisco. But articles and statements from the Municipality indicate that the project has plans to expand into more neighborhoods in order to better serve commuters. 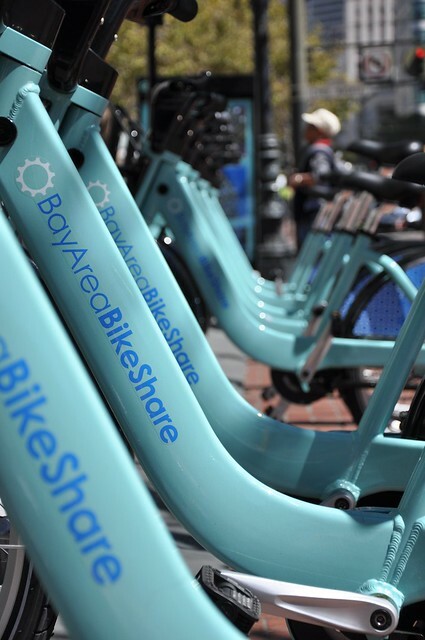 We know from past experience that several bike share projects have started as a test and their network has grown after a while once all the benefits of the system can be seen and experienced. We wish to BABS a lot of success! The system set up in the Bay Area is created by the same company as those in Washington D.C., New York City, and Minneapolis. It's an efficient, easy to use system and the bike is pleasant to ride for short journeys. We could imagine that one day, a common subscription would be valid in all these cities. Meaning that, when you travel from one city to another you keep on using the same system to rent a bike. This idea would require that cities work together and harmonize their pricing policy. It won't be easy to achieve, but city officials should keep it in mind as they expand their individual systems, as it could facilitate more bicycle commuting across the country. 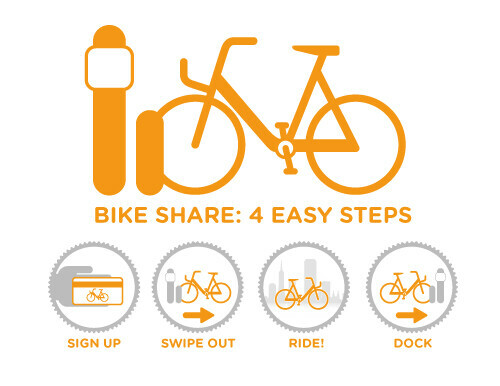 Coming back to the BABS, it is a bike share system created mainly for the local people. Since the network covers a limited part of the city, it is clear that the system was not designed primarily for tourists. So far, it's most useful for employees who work in SoMa or Downtown. San Francisco should really develop the network to make this bike-share work more efficiently. For instance, expanding the network in districts like Mission, Castro, Hayes Valley would definitely allow greater access for more users. Generally speaking, engineers are installing bike share stations wherever they can find a free spot within the public domain. Ideally, these locations could be better matched to fit the needs and interests of cyclists. 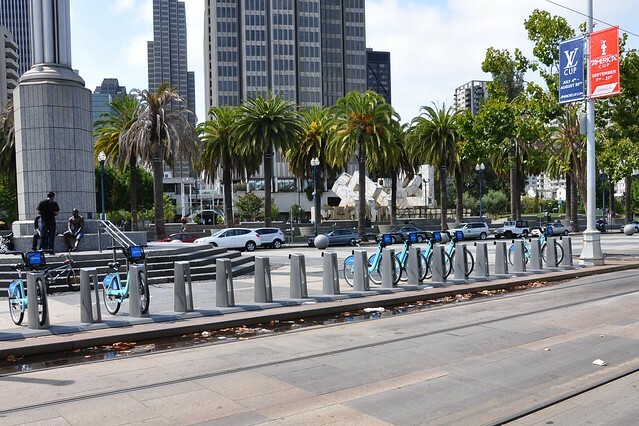 In San Francisco, some bike stations are located as close as possible to the pavement but others are in the middle of the public space and not next to the bike lane. I also want to use this blog post to highlight the amazing work being done by the SF Bike Coalition for the city and its cyclists. 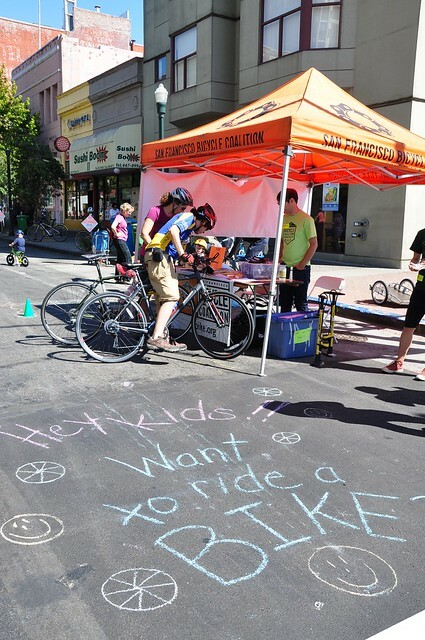 They educate riders, lobby the Municipality to develop more bike infrastructure and organize dedicated events. They also work to create a strong urban cycling culture in SF, turning this hilly town into a city for cyclists.